Come home to a warming bowlful of this scrumptious, low-fat soup. 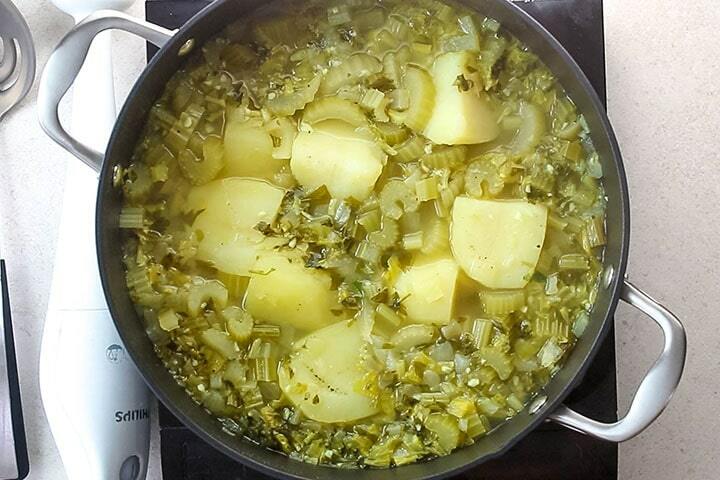 Satisfying and simple to make, this homemade soup is a great a light dinner or a tasty lunch. 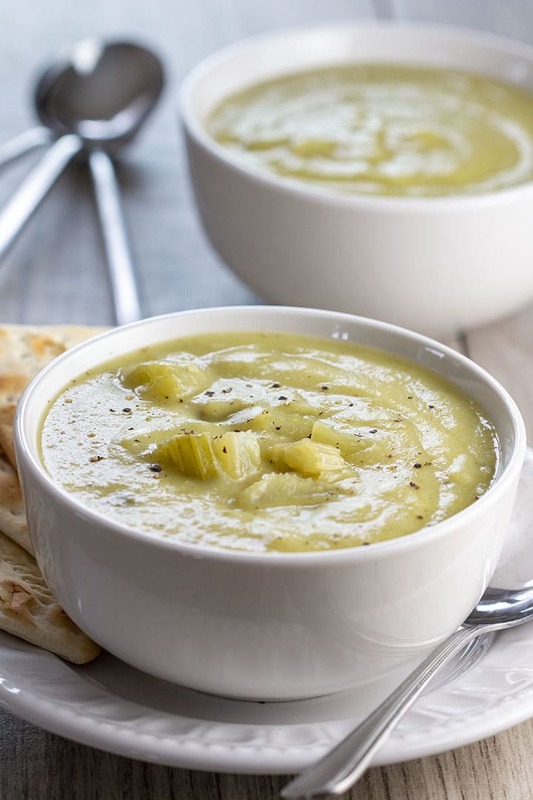 This easy recipe for Creamy Celery Soup has no cream, making it a low-fat, vegan version of cream of celery soup that’s healthy & delicious. Now that the weather is cooling down, it’s time to spend more time in the kitchen! When the weather gets cooler, I want comfort food, and I crave soups in particular! 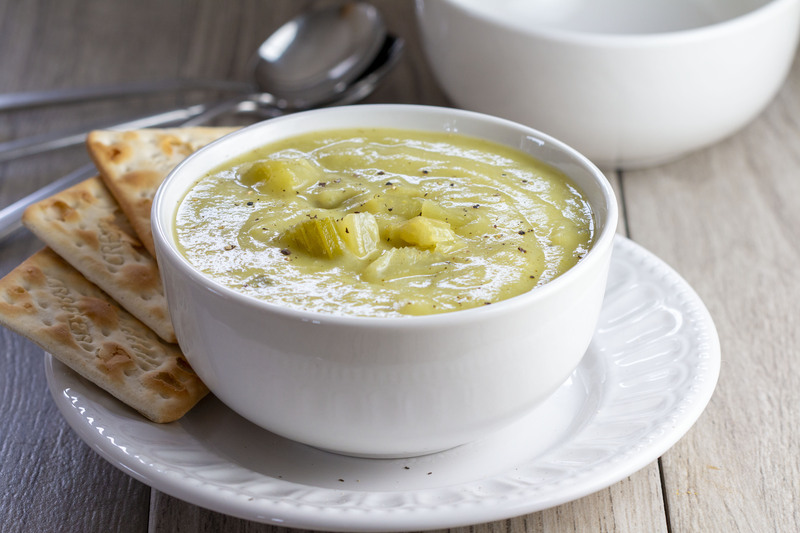 This phenomenal recipe is a healthy vegetable soup that’s silky, thick and creamy, just like when it’s made the traditional way, but this soup has 90% fewer calories! To cut calories, I’ve found a way to make beautiful creamy soups that don’t have a bit of cream. 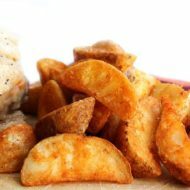 The trick – adding a potato which adds to bulk as well as adding a creamy constancy. 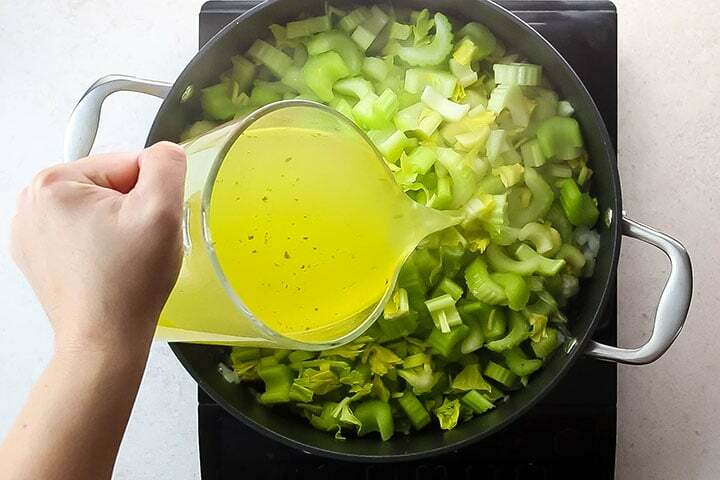 Using large quantities of celery that cooks it in chicken stock with a bit of garlic, makes a soup that is full of flavor without the need of complicated ingredients. 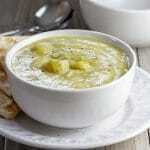 The use of potato to thicken the soup gives it more body and silky consistency. 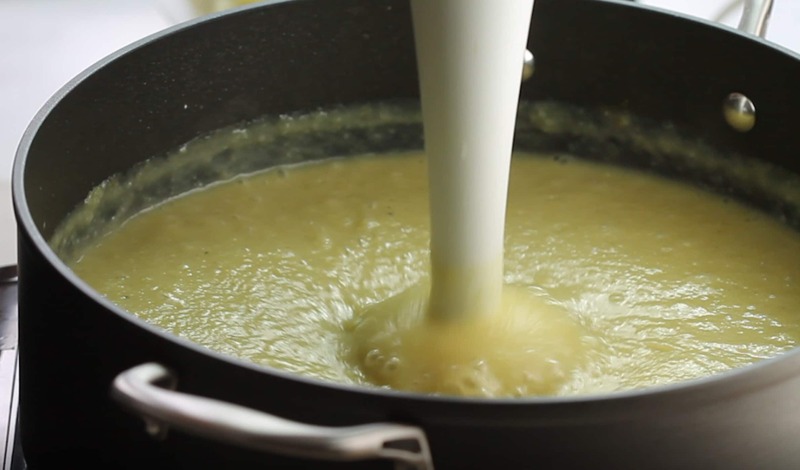 Pureeing the soup with the potato results in a creamy soup without the added fat. This one is my go-to recipes when I’m craving soup I love how quick it comes together. The only tedious part is chopping up the celery, garlic, onions and peeling one or two potatoes. It’s really is simple to make. 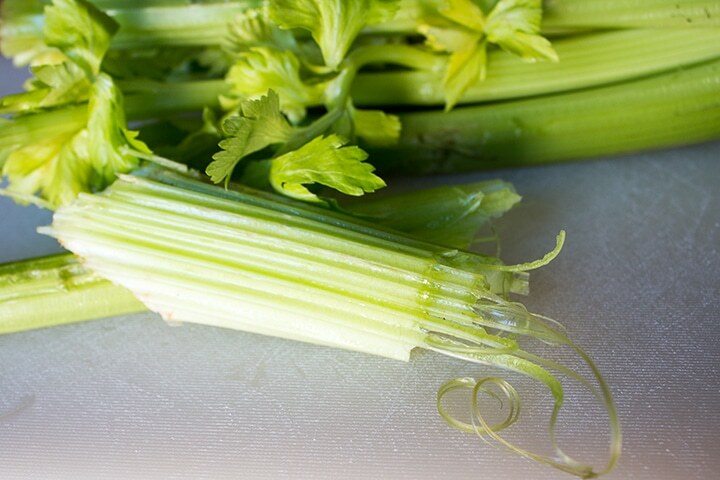 Choose light-colored, crisp celery with firm, tightly packed stalks. Always buy celery with the leaves still attached. The leaves are packed with flavor. Celery leaves should be should be a bright, pale green color. They should also be firm, not wilted or browning. This is a lovely soup. I have friends that absolutely love it even though they don’t normally like celery. Start with cutting the celery into roughly the same-sized pieces, about an inch – 1.5 inches, don’t worry about precision as the soup is going to be puréed anyway. You just want it to cook evenly. Add the salt, pepper, and parsley. Cover and lower the heat and simmer for about 20 minutes or until the celery and potatoes are soft enough that they can be easily pureed (But don’t let them get mushy). 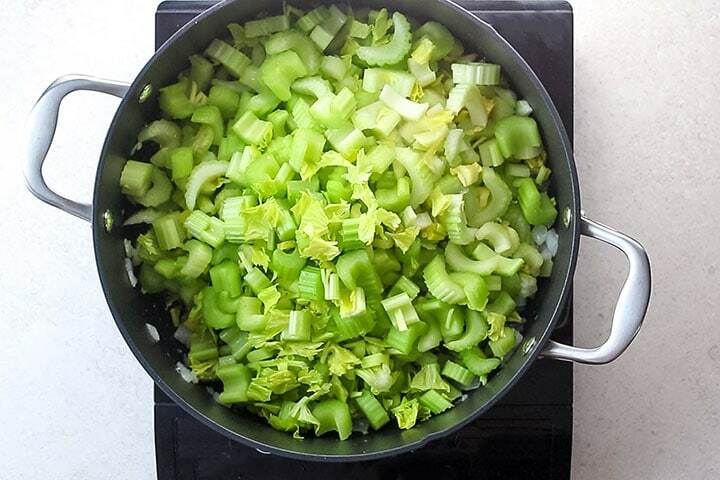 Remove the soup from heat and remove enough stock so that the celery just covered by the remaining stock. Set the reserved stock aside. Then Remove some of the chopped celery and set aside. This will be added back into the soup to give it some texture. Purée the soup with a stick blender in the pot adding the reserved stock little by little until the soup reaches the desired consistency. If you don’t have a stick blender a food processor or blender would work too. Add the reserved celery, mix to combine, serve hot and enjoy! Celery is mostly made up if water (about 95%), making it very low in calories, carbohydrates and fat, but not terribly high in many vitamins or minerals. Celery is a good source of Vitamin K (one cup contains 30% of the daily recommended value of the US FDA). Celery is a good source of potassium, molybdenum folate and fiber. 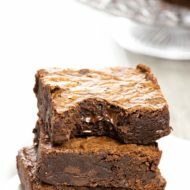 It also contains small amounts of vitamins A, C, and some B vitamins. 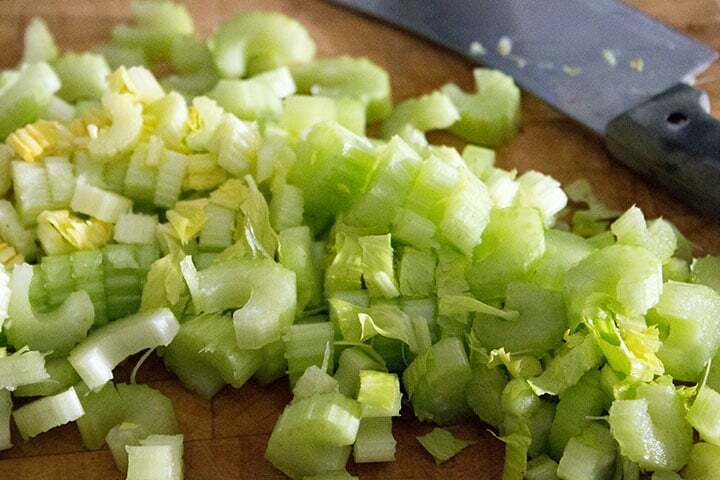 To avoid stringy celery, use the more tender celery stalks that are closer to the middle of the head. Lighter colored celery is less likely to have though strings. To test if your celery is stringy (which for some can be unpleasant), before cutting the celery, break it in half by hand. If you see the strings sticking out of the break (see photo above), peel the celery to remove the strings. 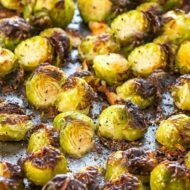 Want a low carb variation? Replace the potato with cauliflower. I’ve done it and it works really well. 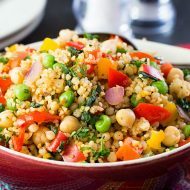 I truly adore this recipe and would just love to know what you think if you try it. 🙂 And I’d love to know what YOUR low-fat secrets are for healthy eating! 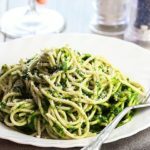 Do you have a secret ingredient or technique? Please share in the comments section below! Chop the celery into roughly the same-sized pieces, about an inch - 1.5 inches, Don't worry about precision as the soup is going to be puréed anyway. You just want it to cook evenly. In a large soup pot, heat the oil over medium heat. 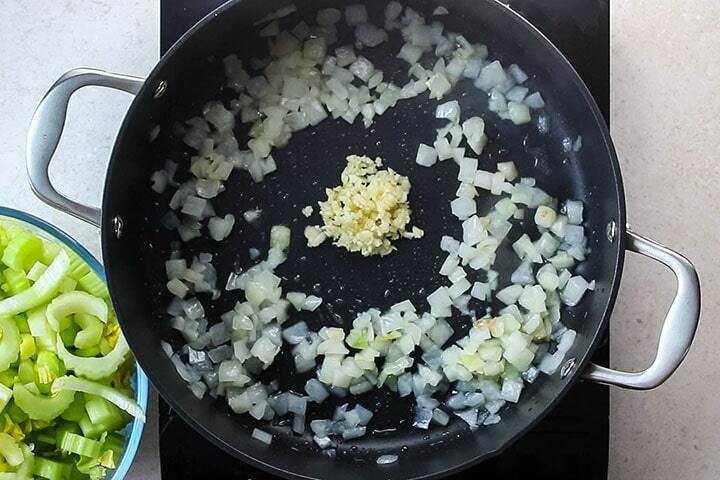 Add the onion and cook until soft. Add the garlic and cook another minute before adding the celery, stock, potato, and parsley. Increase the heat to medium-high and bring to a boil. Cover, lower the heat and simmer for about 30 minutes or until the celery and potatoes are soft enough that they can easily be pureed (But don't let them get too mushy). Remove the soup from heat. If necessary, using a ladle, remove enough stock so that the celery is just covered. Set any reserved stock aside. 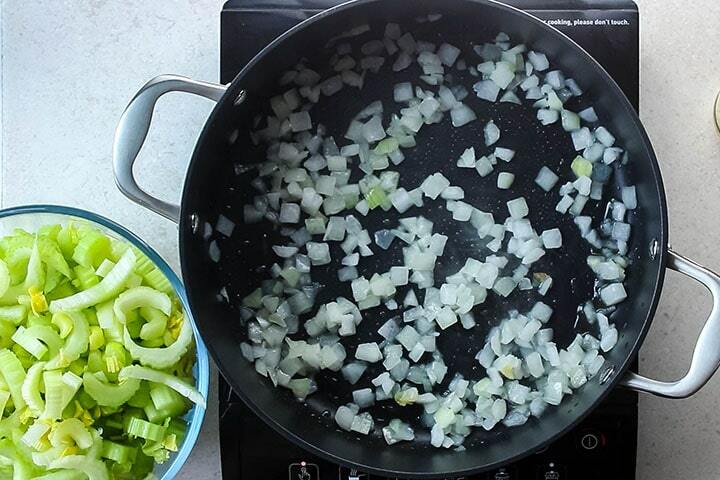 Remove some of the chopped celery with a slotted spoon (1-2 spoonfuls) and set aside. Purée the soup with a stick blender in the pot - adding the reserved stock little by little until the soup reaches the desired consistency. Add the reserved celery, mix to combine and serve hot. If you don't have a stick blender, a food processor or blender would work just as well to puree the soup. 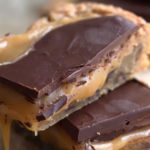 Update Notes: This recipe was originally posted in 2014 but published again in 2018 to include step by step directions, nutritional information, new photos, and a video. 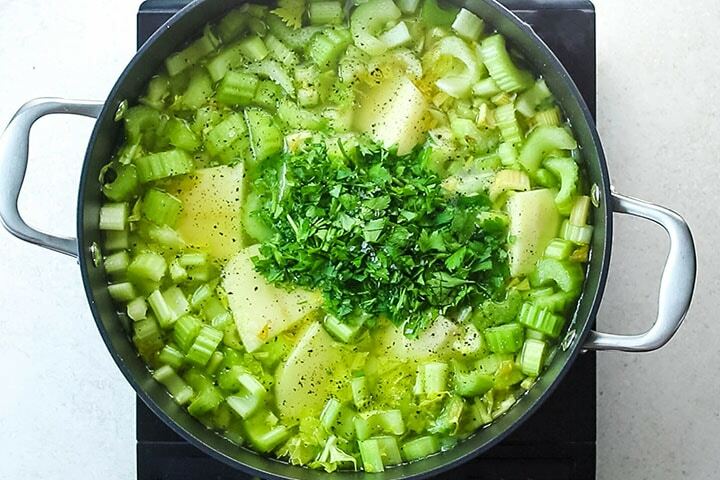 Celery soup is definitely one of my favourites and I’ve made it quite a lot over the years – just needed to refresh my memory on quantities, which led me to your lovely recipe! This is pretty much how I’ve always made it too, although I usually add a small amount of butter in with the oil to fry the onions, and often a few splashes of milk when reheating the puréed soup just to finish. Perhaps not as ultra healthy, but as long as dairy isn’t a problem I think it enhances the flavour of the vegetables. For seasoning I’ll go quite heavy on the black pepper but not so much on the salt, and if I have them I’ll add a bay leaf or two to the chicken stock as it simmers. But always, always, a good grating of nutmeg – that’s my ‘secret ingredient’! 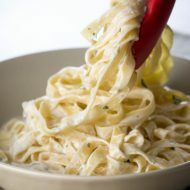 – which adds a nice savoury note that compliments the celery well. Hi, Elizabeth Thank you for your feedback I’m glad you enjoyed and I will keep nutmeg in mind next time I make it! 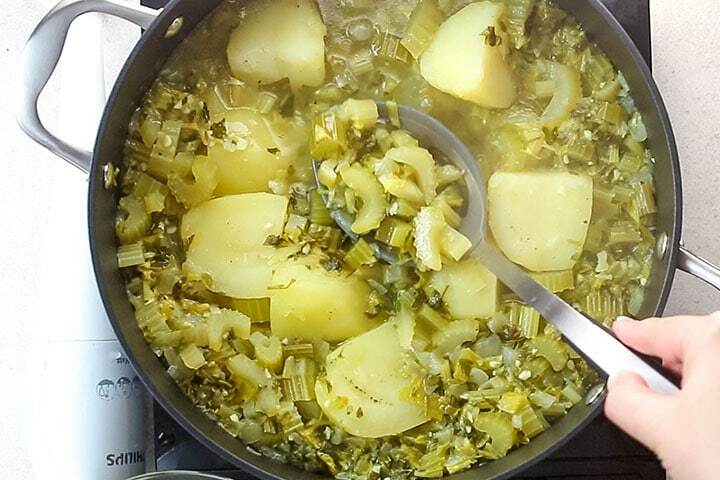 This soup is fantastic – a definite keeper for the rotation. 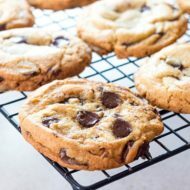 I love how easy it is and how tasty it is! Thank you! Hi Galla, It’s a favorite of mine too! So glad you liked it! 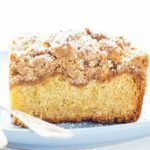 I have tried, it is a delicious recipe. Thanks for sharing. Made it today. 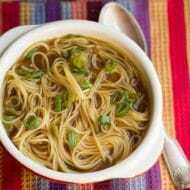 Great soup–I love creamy soups that don’t contain any cream. 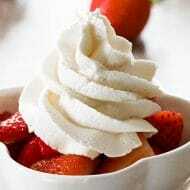 If I ever want to add dairy creaminess, I’ll add a dollop of plain yogurt. Hi Kristine, Good idea! I’m so glad you enjoyed! OMG Soooooooo good! The only thing I changed was to sauté the onions in water instead of oil. It tastes delicious! And no oil either. Oil makes me break out. Hi Jason, That’s awesome to hear and thank you for the feed back! 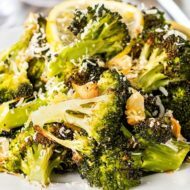 Delicious recipe, both my husband and I are not keen on celery but absolutely loved it, especially as it is low calorie. Awesome, Tina! Thanks for letting me know! 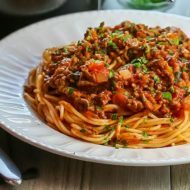 Have you ever made this in an InstaPot? I just got one and would like to try it out. I haven’t. I don’t have one believe it or not, but I’m sure it would work. Let me know if you try it. 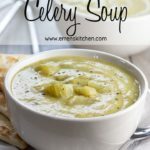 I have made this creamy celery soup, but I had to guess the ingredients, no listing looked for ages, hope it turns out ok…?? Hi, Nola. The recipe is under the tips section. You’re quite welcome! 😊 Hope you like it!